'It's a coastline ravaged by nature and steeped in history, there's a story round every single corner ...you're not just looking at a view, you're standing in the footsteps of kings, and all on one of the most dramatic coastlines nature has to offer.' Janet Street Porter on ITV's Britain's Best View. 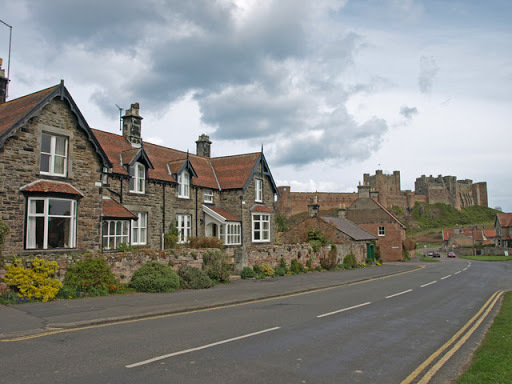 Bamburgh is a stunningly attractive small Village set on the Northern stretch of the Northumberland Coast. It is without doubt dominated by its magnificently striking Castle that can be seen for miles around, giving the whole Village a somewhat dramatic feeling. You can't fail to be impressed by the sheer scale of the Castle once you are up close and in the Village itself. There is much to do in the Village alongside the Castle and it's amazing history, there are impressive stretches of pure golden sandy beaches, many 'proper' English tea rooms and restaurants, St Aidan's Church and a newly renovated museum dedicated to Grace Darling, amongst other things. Buy a full guide to Bamburgh. 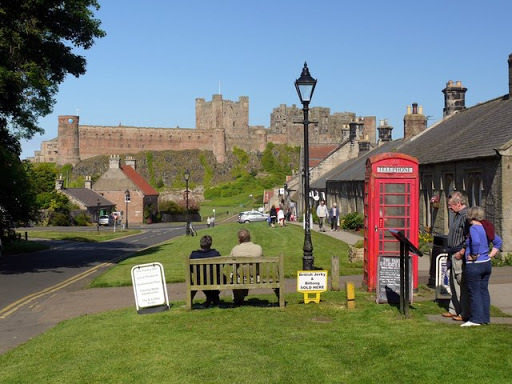 Bamburgh is a stop on the Arriva "Newcastle - Morpeth - Amble - Alnwick - The Coast - Berwick" which is the service between Newcastle and Berwick on their X18 route (see link below for more information). Multi journey tickets are available and you can get more information here. Bamburgh has some excellent quality Hotels, B&B's and Self Catering Cottages. They tend to be more upmarket than in other areas and as such you can pay a premium to stay in the Village. There are still some bargains out there to be found, however due to the incredible beauty of the setting you can expect to pay a just a little bit more than surrounding Villages. With excellent amenities and a glorious beach, I think you'll agree it's well worth it. Bamburgh's beach is often overlooked, possibly because the Castle draws your attention away from everything else the Village has to offer. The Good Beach Guide rates Bamburgh's beach as 'recommended' for the highest UK standard for bathing water quality. The beach does have a dramatic feel to it, being in the shadow of the Castle, but that just adds to it's charm. The beach to the North and South of the Village is of beautiful golden sand, backed by high sand dunes, with the most easily accessible being the beach to the North of the Castle. There is a good long stretch of pure golden sand until it turns slightly rocky at the far North, which is perfect for searching through the rock pools looking for sea life. Self proclaimed maker of Northumberland's finest sausage 'The Bamburgh Banger' R Carter and Son Butchers are located on Front Street in Bamburgh. They have been the Village butchers for over 100 years and have built up an excellent reputation for service and quality. All their meat comes from local farms and they also produce various pies, haggis, white and black pudding and bake their own breads. Visit their website for more information. Also located on Front Street is The Pantry deli. The shop opened in 2001 and has been focussing on building up the delicatessen business ever since. They serve coffees, cakes and all sorts of treats for you to eat now or take home with you. They won a Silver Award in 2009 for their promotion of local produce and now you can order these products online at their website. The Village also has a Grocer and a Newsagent. The nearest supermarket is the Co-op food in Seahouses, however if you would like larger supermarkets you would need to head into Alnwick or Berwick.